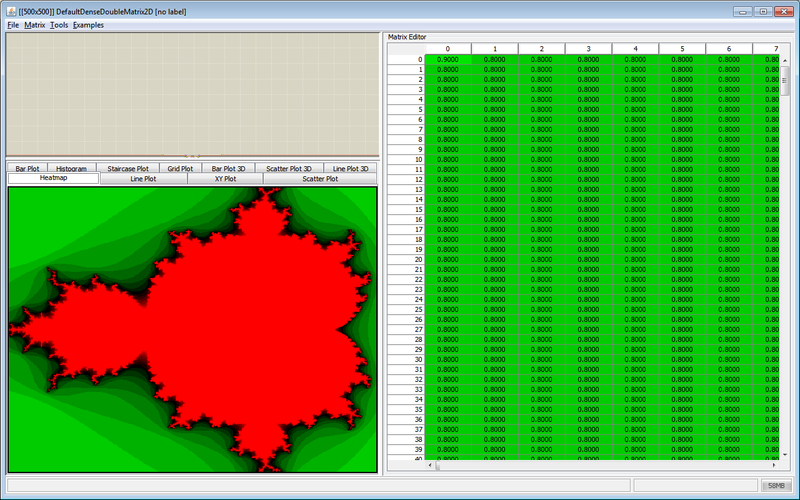 Visualization of the Mandelbrot set. This matrix is filled with random values. Matrix imported from a JPG image. 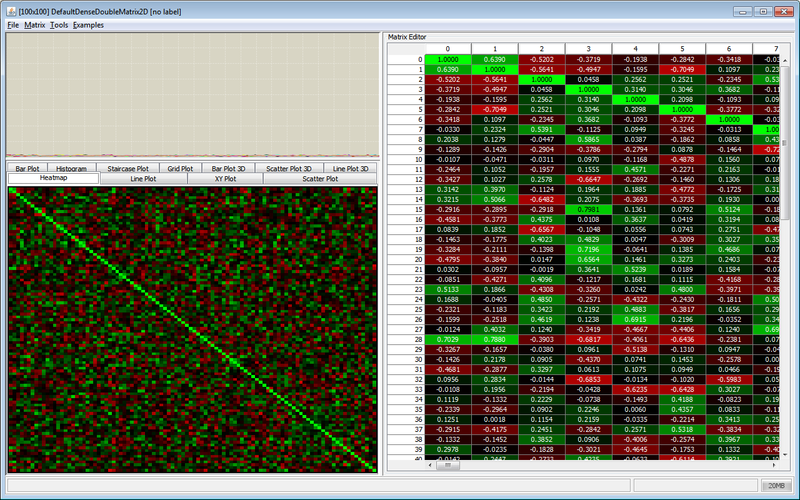 Sparse matrix with 100,000 rows and columns. Only some values are different from 0. 100 random vectors of length 10 have been created with a correlation factor of 0.1. The image shows the pairwise cosine similarity between these vectors. 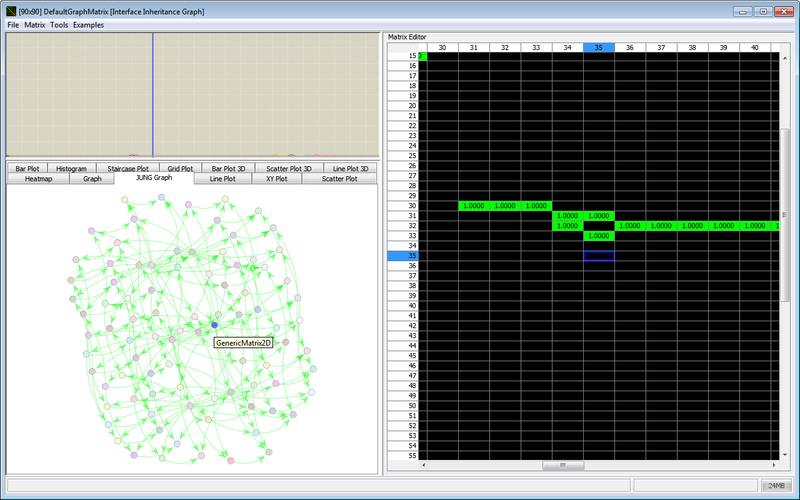 This graph is created from the relationship of matrix interfaces in UJMP. For example, DenseDoubleMatrix extends DenseMatrix and DoubleMatrix. The Universal Java Matrix Package provides various visualization methods, import and export filters for various file formats, and the possibility to link to JDBC databases. Multi-dimensional dense and sparse matrices as well as generic matrices with a specified object type are supported and very large matrices can be handled even when they do not fit into main memory. For UJMP, everything is a matrix: an array of bytes or numbers in main memory, a CSV file on disk, a Java ArrayList or HashMap, a PNG/JPG/GIF image, an Excel spreadsheet, a database table in an SQL database, the database itself with its list of tables, a directory on disk, a ZIP file with the compressed files, and so on. The central concept to achieve this flexibility is the strict separation of interfaces, abstract classes and their implementations, which makes it very easy to exchange the underlying data storage. In fact, the actual storage implementation becomes secondary and UJMP can even integrate other matrix libraries such as Jama and Colt, which enables UJMP's visualization methods and import/export filters for these libraries. UJMP uses multiple threads, which results in much better performance compared to JAMA or Colt. To speed up processing even more, calculations can be redirected to other matrix libraries such as jblas, EJML or Ojalgo, depending on matrix size and computer hardware. There are also interfaces to Matlab, Octave and R, which makes it easy to perform functions not available in Java. Use GenericMatrix<T> to specify the object type that is stored. Matrices can be mapped to hard disk or databases. 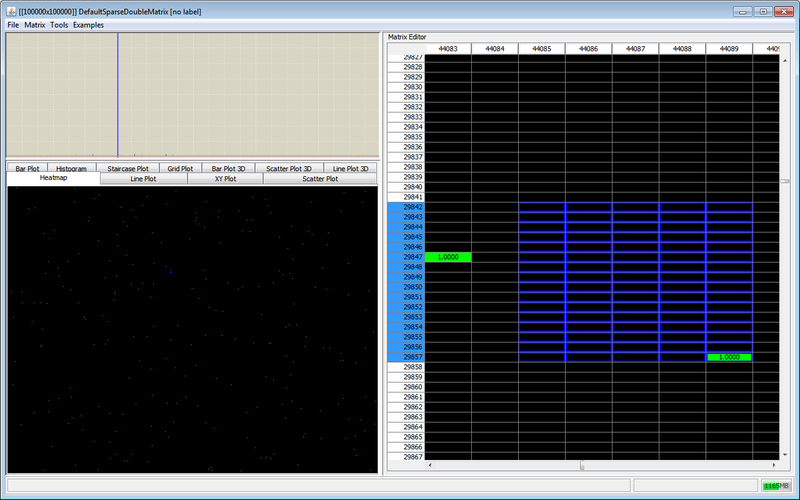 UJMP uses long values for indices instead of int. 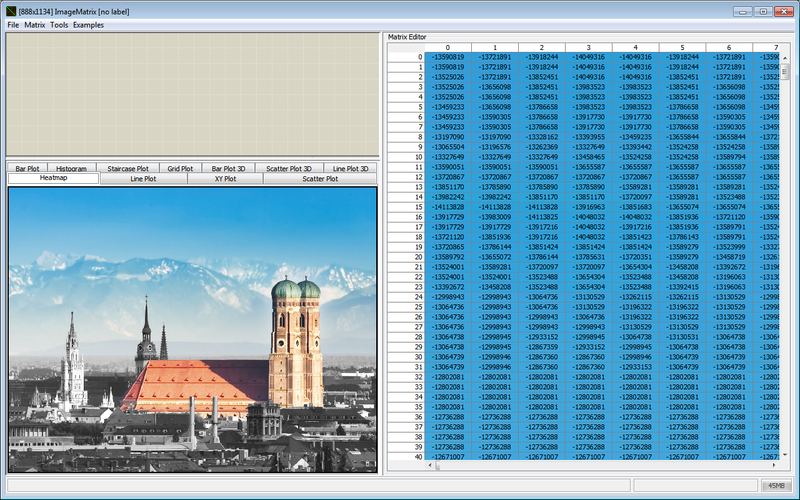 It is easy to label rows and columns or give a name to the matrix. Use Colt or Jama inside UJMP. In fact, you can tell UJMP to prefer a specific matrix implementation over its own classes. Execute complex computations in Matlab, Octave, R or GnuPlot. You can use these software packages as computing or visualization engines in UJMP. TXT, CSV, PNG, JPG, GIF, BMP, XLS, XLSX, HTML, XML, JSON, PDF, LaTex, MAT (Matlab), MDB (MS Access), and many more. e.g. CachedMap, RingBufferList or SoftHashMap which can be very helpful. SerializedObjectMapThis stores all objects on disk and can be used like a normal HashMap. 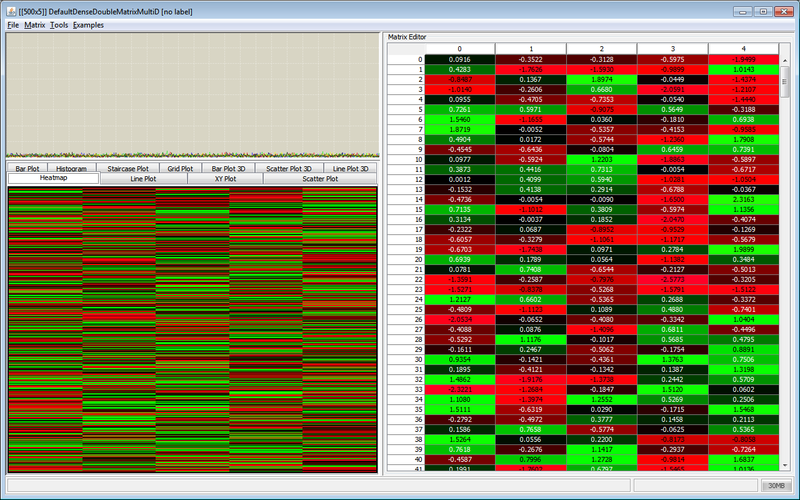 Heatmap, line plot, scatter plot, histogram and many more. 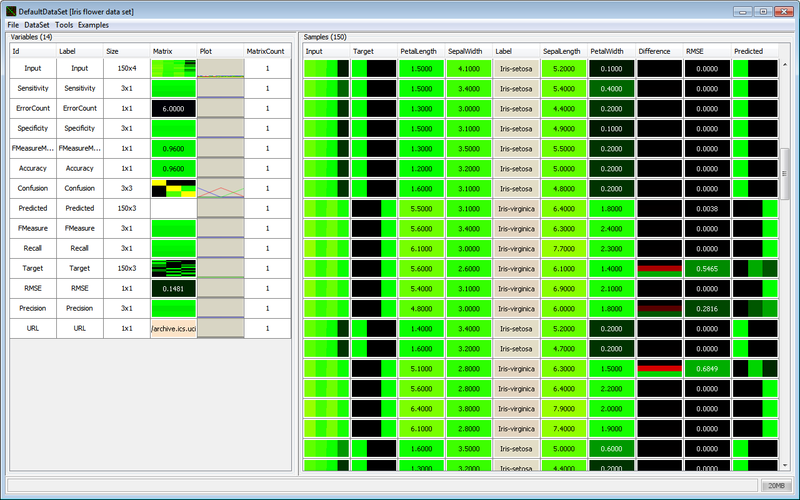 Just use myMatrix.showGUI() to bring it on the screen. Take a look at the screenshots for examples. you can use it in commercial applications. Curious how the Universal Java Matrix Package is different from other Java matrix libraries? Compare it. If you just need linear algebra for double matrices, there are probably better choices, such as EJML or Ojalgo. Then click on "Tools - UJMP Plugins" in the menu bar and see what third party libraries are supported. Chose the tool you want, add the necessary dependencies to the class path and restart UJMP. // load image into matrix. of course, this works with files, too. // a matrix. Have fun exploring, but be careful when you change data! UJMP is the computational back-end of the Java Data Mining Package (JDMP), which is our second open source Java project. While UJMP is the workhorse for matrix operations, JDMP concentrates on higher-level objects, such as DataSets and Algorithms for machine learning, like clustering or classification. JDMP continues the philosophy that everything is a matrix, which makes it easy to benefit from UJMP's features. The strict separation of interfaces and abstract classes allows JDMP to easy integrate other libraries like Weka or Mallet.